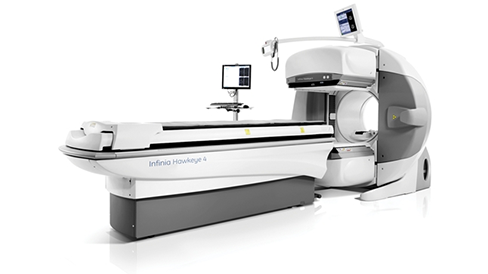 The GE Infinia Hawkeye is a premium, high-performance, all-purpose dual detector hybrid SPECT/CT imaging system, all in the same footprint as a traditional nuclear medicine camera. The low-dose, helical Hawkeye CT provides excellent image quality for localization and attenuation correction. The free-geometry gantry design enables both 180° and 90° orientations of the detectors for high scanning efficiency, as well as upright and horizontal detector orientations for maximum clinical versatility. An exclusive slip-ring gantry design provides a solid infrastructure for advanced acquisition modes. Other core components include a PC-based acquisition station, dual-axis imaging table, real-time automatic body contouring and an easy to learn, intuitive Windows-based user interface. The fully integrated Hawkeye CT provides inherently registered CT images for fusion with SPECT images, as well as, anatomic localization to match SPECT resolution, helical scanning capability for shorter exam times, quality-controlled attenuation correction maps for improved diagnostic confidence and adjustable exposure parameters to optimize image quality and patient dose.